Terlingua, Texas is now a ghost town, but for one remarkable period, it was the crossroads of three distinct cultures: Hispanic, Anglo, and Native American. Together, they scratched out a living in this harsh and unforgiving land from the late 1800’s until 1943. Now, 61 years later, the last of the original Hispanic inhabitants returned home. In a hauntingly beautiful celebration of the Day of the Dead, on a full-moon night, they came back to remember and to celebrate. In the traditional ways of their culture, they honored the spirits of their Terlingua ancestors. A Terlingua Homecoming will be a one-hour documentary film for PBS that examines the story of a unique Hispanic population that lived and worked on the frontier border of Texas and Mexico near Big Bend . They came as refugees escaping the bitter conflicts of the Mexican Revolution. These campesinos were some of the worst victims of the Revolution; caught between the abuses of their hacendado landowners, Mexican Federal troops, and revolutionaries led by Pancho Villa. Nearly a million would flee to the United States between 1910 and 1920. In Terlingua they found a safe haven, opportunity and hope working in its quicksilver (mercury) mines. They also suffered discrimination and exploitation at the hands of their Anglo employers who had come in search of fortunes from cinnabar, the ore from which mercury is extracted. The film's story will primarily be told through the homecoming celebration in Terlingua in October, 2004. 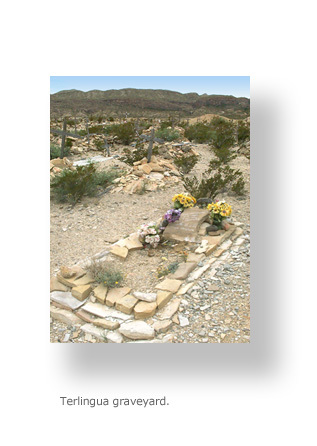 This reunion brought together the last living residents of the mining town and their families in a weekend of activities that included traditional dancing, singing, food, and worship, culminating in a candlelit evening spent in the century old Terlingua graveyard. In observance of the traditions of the Day of the Dead, they repaired the crumbling monuments and decorated them with tin flowers in anticipation of the return of their ancestors’ spirits. Few of these family members had died of old age. Most succumbed to the brutal environment, disease, mercury poisoning, and violence that were a way of life in Terlingua. During the reunion there were excursions to the abandoned mine sites and old homesteads by the original residents. Our crews recorded their memories and their emotions. Along with interviews of current Terlingua residents, Texas and Hispanic historians, Big Bend naturalists, and archival photos and films from this historical period, we hope to reveal the richness of this culture and how it survived the passage of time in this remote corner of frontier America. The story of Terlingua also affords a look at early American industrialism. These quicksilver mines were some of the nation’s most productive, supplying nearly a third of the country’s mercury from 1890 to 1943. Towering above all the operations was the Chisos Mining Company. It owned the town of Terlingua, and industrialist Howard Perry was this mining dynasty’s absolute ruler. Perry carved a self-contained company town out of the barren land and along with only a handful of Anglo managers, he lorded over a Hispanic workforce that numbered nearly 2000 at its peak. In the end, unrealistic dreams defeated Perry. The ore played out, his many investments went sour, and the demand for mercury disappeared. The Chisos Mining Company, named for the nearby mountain range whose name means, "ghost", would became a ghost town following its bankruptcy in 1943. The land is also a central character in the drama of Terlingua, cutting across and dominating the lives of all who lived here. Its brutal power has always placed limits on every dream that would come to be planted here. Because of the land, Terlingua remains profoundly isolated, mysterious and mostly undeveloped — but all this may be changing. Like the early mining interests who would have turned this region into a sprawling, industrial powerhouse, modern real estate developers are moving to transform it into the next Palm Springs. The filmmakers plan to include interviews and images from the nearby Lajitas Resort Development. And of course, there is the famous Terlingua Chili Cookoff, an event that now annually attracts nearly 10,000 visitors. By juxtaposing these stories, the film will pose some interesting questions. Can the new forces of change finally master this wild place, or will the land prevail on its own terms? The story of one people whose ancestors’ spirits still walk the ruins of Terlingua may contain the answer.